Italian dancing-master; flourished in the fifteenth century at Pesaro. His master was Domenico di Ferrara, in whose "Liber Ballorum" (1460) he is mentioned. Guglielmo himself wrote a treatise on dancing, "Trattato dell' Arte del Ballare," edited by F. Zambrini, Bologna, 1873; 2d ed. by Messori Boncuglia, 1885. 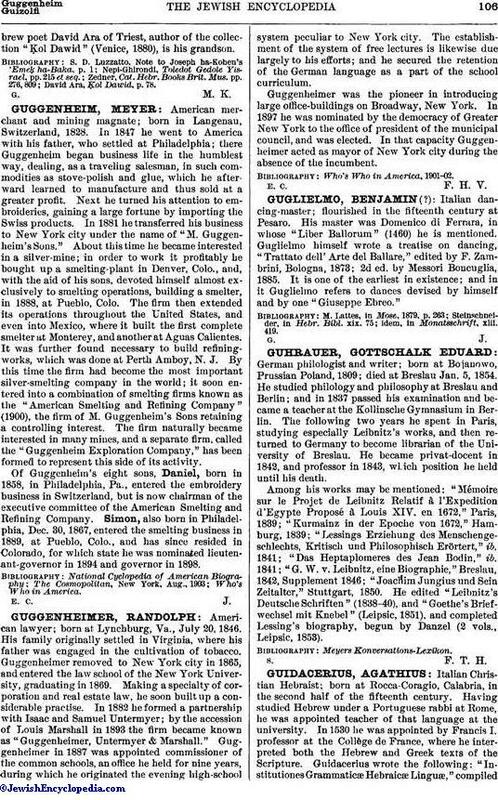 It is one of the earliest in existence; and in it Guglielmo refers to dances devised by himself and by one "Giuseppe Ebreo." idem, in Monatsschrift, xlii. 419.